A 55 gallon drum with an open end on bottom and a hole cut in the top. Also a circle of 1/8" sheet a few inches larger than the drum hole to form a lid. The drum is supported on 3 firebricks. Sand is placed around the base and kindling and old brands are placed in the bottom of the barrel. 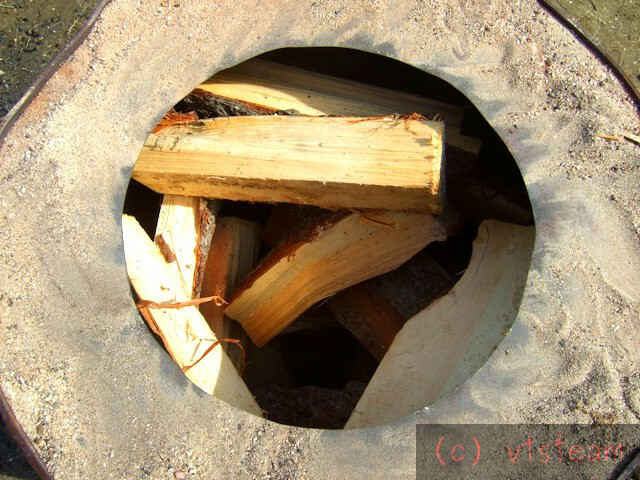 A post is set vertically in the middle of the barrel to act as a chimney form when packing the wood in. After loading wood, the post is removed leaving a center space, as seen here. The kindling is lit. The fire builds quickly -- a little smoke at first, but it soon settles into a clear clean burn (unlike many other charcoal methods I've seen). When the fire burns down some I place the lid partially over the top hole. I regulate the opening so the fire is just short of smoking. At this point I may also put some large pieces of aluminum over the exhaust if I want to crack it up easily after heating it so the aluminum will fit more easily into a crucible. I also regulate the fire by adding more sand around the bottom of the barrel. Eventually when the wood has burned down to about 1/3 its original volume, I cover it completely with the lid. I pull the firebricks out from under the barrel while supporting it with a shovel in one hand to keep it from tipping over. The whole process takes maybe an hour. Then it's time to let the barrel cool. That may take 4 more hours. It should be absolutely cool to the touch. If not, it may be that air is still being allowed in through a leak. You must seal the leak and make sure the fire is completely out with all embers dead before opening it up. So check after a coaling a few times and wait for cool! 20 gallon leaf bag filled with hardwood charcoal. Before bagging, be absolutely certain that the charcoal is dead out and cool. Best to wait a day before bagging, just to be safe. Petley Wood across the main road from us was home to charcoal burners up to the 1970's (before we came here) apparently the smell was awful. They used mainly Hornbeam. Seemingly the practice was a carry over from when our bit of Sussex was alight with small scale iron founders, then when the iron ore gave out they went on to make gunpowder. There are still large steel kilns in the woods that they used. 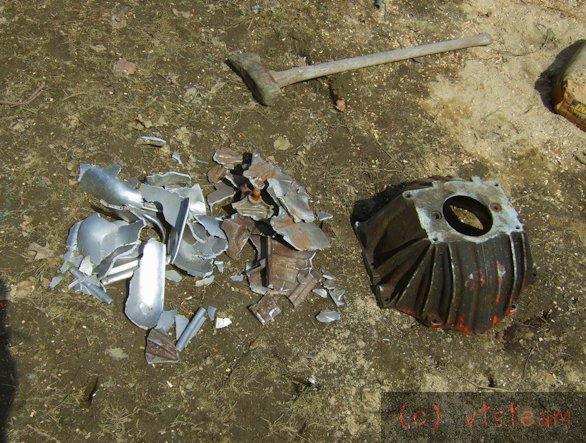 Guessing, but probably 15 foot diameter by 5 foot high with a hinged top piece that is now largely rusted away. Mine doesn't smoke within minutes of lighting because I run a lot hotter with a lot more oxygen. I can do that because the small scale doesn't create the massive impossible to control heat a large one would if you tried it that way. Mine is more like a reverbatory furnace with the constricted exhaust port. My charcoal retort also runs for considerably shorter period, depending on the wood thickness. Usually an hour, or even less with small stuff. My charcoal will be used for casting. I hope to do both cupola and crucible CI with it shortly. How much charcoal per volume of wood do you get? Also, what wood are you burning there? Mayhem, difficult to estimate, but about 1/4 to 1/3 of original volume of wood. Volume is pretty difficult to measure considering all the air space I get while stacking. (actually just dropping in from the top). My stack is a lot looser than the traditional methods. But my burn is a lot faster. I don't have to tend a stack for 48 hours without sleep! A better measure might be weight for weight, because you could use a scale, but I haven't tried that yet, and it also would depend on moisture content -- green wood is 50% moisture content by weight, dry wood is under 12%. So difficult to figure how efficient this method is compared to others unless they had comparable moisture and wood density. The wood I used in the photos was white pine slabs (wane) from my sawmill. The charcoal is therefore softwood charcoal. Prior burns this week were maple. Other frequent hardwood for me here is black birch (sweet birch). 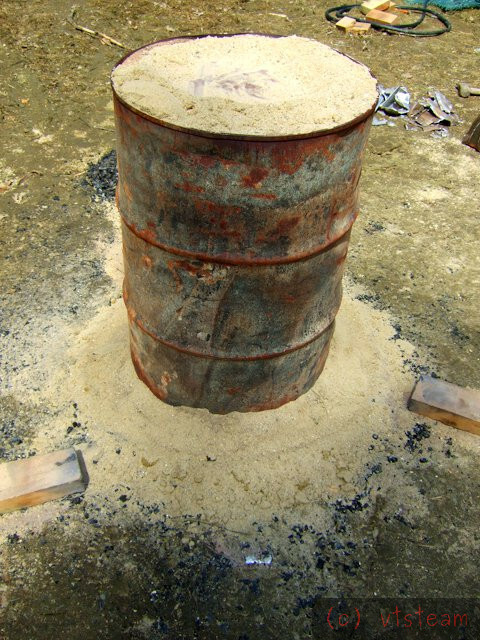 There are many charcoal making methods, some of which I've tried in the past. But I like this one the best because of its simplicity, speed and easy control of the burn. I don't believe it is much more wasteful than any of the others, and I have a great surplus of wood to get rid of anyway from my sawmill. Re. 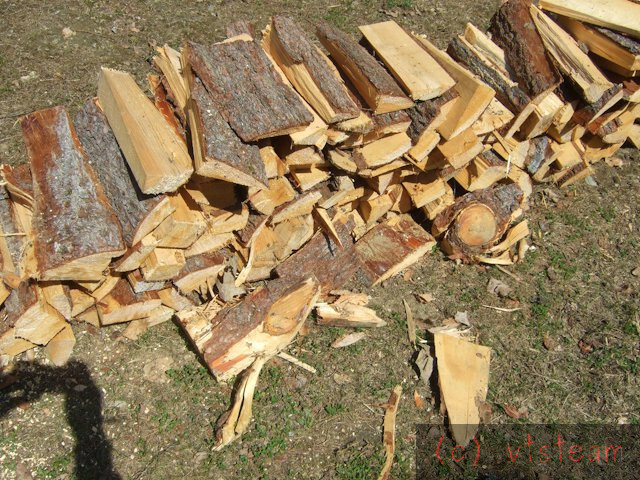 pine: hardwood charcoal is denser than softwood charcoal, and a more suitable furnace fuel. But I'm working on an idea for densifying the softwood charcoal into briquets. My cupola needs charcoal in the 3/4" size so I don't need big pieces. A lot of experimentation will go into this starting shortly. 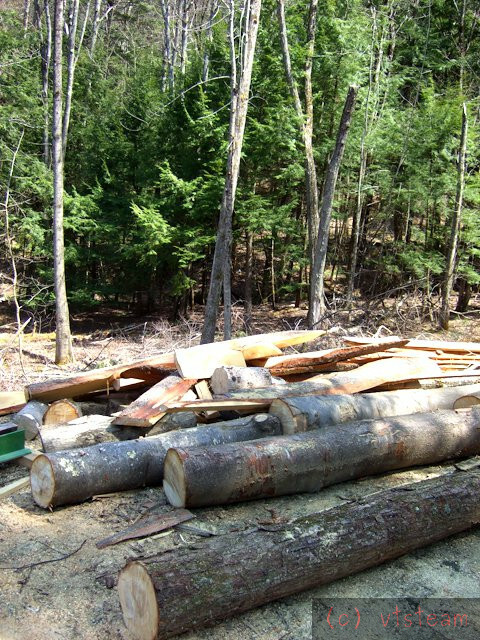 Here's a picture of the pine wane cuts I used for the above burn, and and birch and soft maple logs and awaiting the sawmill, as well as scrap wood. Send your surplus timber over here Vtsteam - it may burn fast but my log burner has quite an appetite and at the moment I'm reduced to burning willow which is very light and fast burning! I would be really interested in seeing a video when you try those furnaces for the first time melting iron. Charcoal burns very fast compared with coke so you will be adding charcoal a lot when melting cast iron. I have been thinking a lot this winter about densifying the charcoal into briquets. If I can achieve the same density as coke then I think the consumption rate might be the same, since they are both pretty much pure carbon. Briquetting might also make softwood charcoal viable as a furnace fuel. 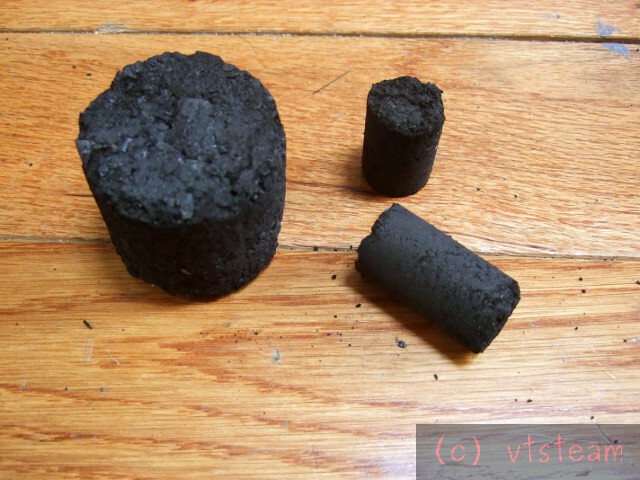 Above are some experimental charcoal briquettes. The large one was made this winter and is fully dry. The smaller ones (3/4" diam) were made this afternoon from softwood charcoal. They need to be dried before I can get an estimate of density. The large briquette is probably hardwood, but the grain size is rather large compared to the smaller ones. I think the new softwood briquettes will actually be denser because the charcoal was more thoroughly crushed. I do have a density for the large briquette. It is 0.58 g/cc. 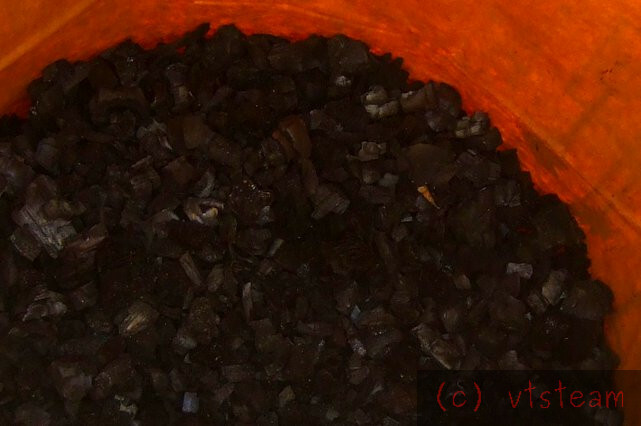 Charcoal is generally less than half that (0.2-0.3), while furnace coke is 0.6 to 0.7. So I believe I can get in the ballpark. I can also make it uniform size to suit the cupola. I think 3/4" is going to be appropriate -- at least according to Stewart Marshall. What is the binder you are using for the briquettes? This is an interesting and informative post. Ironman, I just used a very small amount of flour in water. I imagine corn starch, wallpaper paste, etc. would all work, but flour was handy. Density of the small softwood pellet looks to be 0.56 g/cc. That means it is about the same as compressed hardwood charcoal. Which actually makes sense. Only the physical structure of softwood makes it lighter. The material, nearly pure carbon, is the same. We're interrupting that structure by compressing it. The original softwood charcoal it comes from averages about half that density. So I would expect the energy density to be about doubled. Probably less for hardwood, but the result is the same with either material. One question I have is, will the binder keep it together in the furnace long enough to be useful. I'm guessing yes. I do think the consumption rate will be higher than coke, as I expect it will fragment to some degree, and produce more burning surface. On the other hand that could mean a hotter temp in the melting zone. It may be that the size of the pellets might have to increase a little above rule of thumb for coke in a cupola. 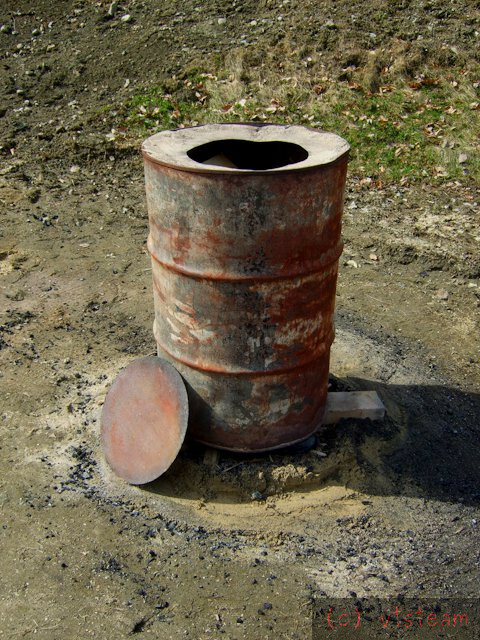 That would reduce surface area, increase space between pellets, and balance the fuel air mix better if compressed charcoal burns hotter and faster. More convenient briquetting also. All theories, of course, until I try it out. As a ballpark estimate, I might first try 1" dia. I experimented with molasses as a binder for carbon and it held together even though the lump was glowing red. Then it slowly starts to crumble. I'll try that too, then, ironman. I don't have all the gear for iron yet. I need to make tongs and shank. Maybe this week. I might try it as a crucible furnace first. Bore is 20" x 7" dia. 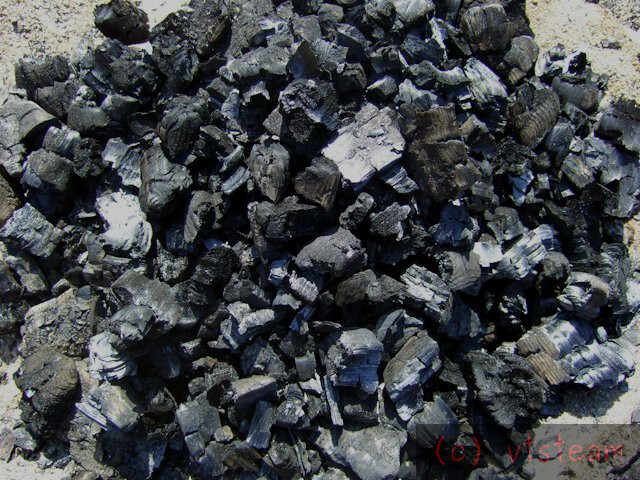 The best binder for making briquettes from carbon is pitch from black coal. Coking coal has it and coke does not crumble at any temperature but does very slowly burn. Coke and charcoal are both carbon based but burn at different rates. Coke is classed as unreactive so it burns very slowly. Charcoal is classed as reactive and burns very quickly yet both are carbon. Electrodes in arc furnaces melting steel and iron are made from coke and pitch and the same goes for dry cell battery electrodes. When I melt iron I put coke on top of the cast iron to stop the metal burning and turning to slag. When I am ready to pour I just scoop of the the coke and use it for the next melt. If I did the same thing with charcoal I would have to replace it at least twice. I do have large lumps of coke and have machined it in the lathe. I have made a small crucible and many stirring sticks with it. As a stirring stick it lasts forever with cast iron as it is very unreactive. It will not dissolve in molten cast iron. Charcoal will but very slowly. I have used an induction furnace to change steel to cast iron, coke will dissolve very slowly but as the carbon content comes to cast iron level the excess just floats on top. As a crucible it needs a coating to protect it from the flames in a furnace. Interesting and helpful. But I don't have access to coke.